Imagine a desk. It belongs to Sue, the HR manager for a major widget warehouse. Near the bird sits a pile of 300+ general warehouse resumes. Yours rests somewhere in the middle. Automation is replacing warehouse jobs in record numbers. Pickers, packers, stockers, clerks, and even warehouse coordinators and managers will take a hit. You need to match your skills and dedication with a job that fits those qualities. That's why your resume is vital. It needs to light up like an Andon light. If not, that coveted job will roll by like a forklift operator who skipped his morning coffee. A warehouse resume example better than 9 out of 10 other resumes. How to write a warehouse resume that will land you more interviews. Tips and examples of how to put skills and achievements on a warehouse resume. How to describe your experience on a resume for a warehouse to get any job you want. Here's a sample resume for a warehouse worker made with our online resume builder. Warehouse Resume Example - See +20 resume templates and create your resume here. What's the Best Format for a Warehouse Resume? Warehouse operators bring laser-focus to a fast-paced world of intricate details. Of course your resume must highlight this ability. 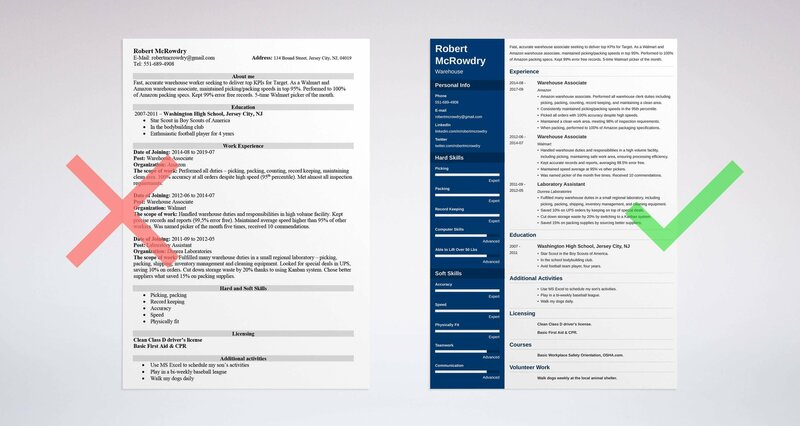 Pick a respected resume format like the reverse-chronological layout. It puts your best skills, experience, and qualities up front. The average HR manager spends just six seconds on each resume. Make sure your resume destroys that average with a solid format. Use clear, legible resume fonts, white space, and big, eye-friendly headings. Last, save your resume as a PDF. Word documents can scramble and pass that juicy job to the next applicant. Pro Tip: PDFs work best, but check the job offer to make sure they're OK. Some applicant tracking systems aren't compatible with warehouse resumes as PDFs. Not sure about the reverse-chronological format? See this guide: "3 Resume Formats: How to Choose the Best One [Examples]"
Should you write a warehouse resume summary or a resume objective? If you don't have racks filled with experience, use a warehouse resume objective. They're for career changers, fresh graduates, or warehouse workers seeking a new niche. A resume objective just states your job goal. If you've got experience like Darryl at Dunder Mifflin, write a warehouse worker resume summary. A resume summary shows experience and skills in one whack. Warehouse associate with 6+ years experience seeking to deliver top KPIs for Target. As an Amazon warehouse associate, maintained picking/packing speeds in top 95%. Performed to 100% of packing specs. Kept records 99% error free. 5-time Walmart picker of the month. Efficient former Walmart warehouse associate, seeking new warehouse job. Fast, accurate picker/packer with good communication skills. Pro Tip: A winning warehouse resume needs measurable details. The best resume objective for a warehouse worker will always pack in proof. You've got 4-6 lines to tell the hiring manager about your warehouse experience. It's like being lost in an ocean of competing facts. Luckily, you've got a compass. It's the warehouse worker job description. The way to use the warehouse job description for a resume? By harvesting the resume keywords. Start with your most recent job. Tie it to the job offer with strategic resume bullet points. Imagine a job that needs speed, accuracy, picking, packing, record keeping, and housekeeping skills. Then look at the warehouse associate resume sample below. Warehouse associate at Amazon. Performed all warehouse laborer duties including picking, packing, counting, record keeping, and maintaining a clean area. Consistently maintained picking/packing speeds in the 95th percentile. Picked all orders with 100% accuracy despite high speeds. Maintained a clean work area, meeting 98% of inspection requirements. Responsible for various picking/packing warehouse duties and responsibilities. Maintained a clean work area. That first example shows how to put warehouse duties on a resume. Stick them in your bullet points and tie them straight into the job description. It works whether you're writing a warehouse associate resume or a warehouse manager resume. The only difference is the details. When writing an entry-level warehouse resume, you don't need much experience. But what if you've got zero? Dig through your past non-warehouse jobs to turn up warehouse job experience. See these resume examples for warehouse workers. Full time lab assistant in a small, regional laboratory. Filled the warehouse helper job description, including picking, packing, shipping, inventory management, and cleaning equipment. Saved 10% on UPS orders by keeping on top of special deals. Cut down storage waste by 20% by switching to a Kanban system. Warehouse Experience: No warehouse experience. Job duties are mostly in custodial field. See the difference? The first one shows how to write a warehouse resume with no experience. Think: "What is a warehouse associate?" Then think back to when you've performed those tasks. Then pick your biggest wins that meet the job offer. Pro Tip: Use the warehouse resume template up top as a warehouse supervisor resume sample. Just add warehouse supervisor duties and responsibilities. Want to make your warehouse manager resume sparkle like you wrote it on safety tape? Use resume action words. See this guide: "+80 Examples of Resume Action Words for Every Profession"
Warehouse workers don't need an education. That means schooling doesn't matter. Right? Would you be shocked to know that's wrong? The way you list your education can be the one thing that gets the interview. It all comes down to your education warehouse resume bullet points. Then, add bullet points that fit the job opening. Star Scout in the Boy Scouts of America. In the school bodybuilding club. Avid football team player, four years. That first example says, "I went to high school." The second? Pro Tip: Before you add bullet points to a resume for warehousing, think, "What does a warehouse associate do?" Pick accomplishments that match. Want your warehouse resume to stand out like a "Caution: Wet Floor" sign? See our guide: "How to Put Your Education on a Resume [Tips & Examples]"
We don't want the HR manager to say that when she reads your resume. But she might if you don't prove your skills. Get warehouse worker resume skills from the job description. Prove them in your resume bullet points. Read the job posting. Highlight all the skills you see. Think hard. Do you have those skills? Have you ever demonstrated them? If yes, write down the most impressive instance. Then use that as a bullet point. Then, add your most eye-catching warehouse resume skills that aren't in the job offer. The warehouse helper job description lists speed, accuracy, and record keeping. So, list those. But add safety and picking because you've got them and they're brag-worthy. Handled warehouse duties and responsibilities in a high volume facility, including picking, maintaining safe work area, ensuring processing efficiency. Kept accurate records and reports, averaging 99.5% error free. Maintained speed average at 95% vs other pickers. Was named picker of the month five times. Received 10 commendations. Do this, and you'll beat the rest. But don't make the HR manager read another generic shipping and receiving resume. Let's get this party started. Use these warehouse skills for your resume. Find more by searching through warehouse positions lists online. If you follow the above instructions, your warehouse associate resume will match the job like an order packaged in the perfect corrugated box. Pro Tip: Don't show every skill. In a warehouse worker resume, list the most impressive. Don't make the manager read a Russian novel. Want to expedite your skills section? Use the warehouse resume sample from the top of this guide. Also, see our article: "+30 Best Examples of What Skills to Put on a Resume (Proven Tips)"
Let's return to Sue, our HR director with a pile of resumes as high as her bob cut. You need to make her say the words above as she tries to quickly scan your warehouse resume. One way is to add some wow factor you might not even know you've got. That can be accomplishments, second languages, passions, hobbies, or volunteer work. Spend a little time to find these bonus goodies. Twenty minutes jotting on a notepad can turn up the hidden gem that gets you hired. Maybe you took a lean training class four years ago. It only took two hours, but it's the one thing HR managers always comment on. Use MS Excel to schedule my son's activities. Play in a bi-weekly baseball league. Clean Class D driver's license. Basic Workplace Safety Orientation, OSHA.com. Walk dogs weekly at the local animal shelter. Enjoy watching "Game of Thrones." See how the "right" example shows qualities that make a better warehouse worker? Both examples could come from the same candidate. The first shows details that match the job offer like they've been stuck to it with strapping tape. Pro Tip: Don't have any "other" details? Build some. Take a few online safety courses. They're cheap, fast, and look great on a warehouse worker resume. Need warehouse resume ideas for your "other" sections? See our guide: "+20 Best Examples of Hobbies & Interests To Put on a Resume (5 Tips)"
Nobody reads boring cover letters. "Wow. I've got to give this warehouse resume a careful read." Start with the manager's name. It's the one thing guaranteed to get attention. Here's the other guarantee: key facts about the company. Learn some online that interest you, and say it. Then, cite your biggest "wins" that match the job posting. This is one more way to make the hiring manager the subject of your cover letter. Basically, show how you can help her meet her warehouse objectives and goals. Last, wrap up with a call to action like, "I'd love to talk with you about your needs." Pro Tip: Follow up. A follow up email can mean the hiring manager reads your warehouse associate resume a second time. Want more warehouse cover letter ideas to write your own masterpiece? See our guide: "How To Write A Cover Letter [Complete Guide With Examples]"
Lots of job seekers say the above when they learn the truth about contact info. But there's a big mistake you might be making. Add a LinkedIn profile, Twitter handle, or other online addresses to your warehouse resume. This is your chance to show off more about you. First, your LinkedIn profile is an extension of your resume. Use it to show professional photos, pics of you at work, and other assets that you can't fit on a resume. Second, avoid Facebook. It's a little icky on a resume for a warehouseman. Pro Tip: Managers will troll your Facebook profile even if you don't include it in your resume. Make sure to sanitize it. We've got some handy tips for that right here. Want more warehouse resume ideas? See this guide: "How to Make a Resume: A Step-by-Step Guide (+30 Examples)"
"Of the 600 resumes I looked at, yours impressed me most." I actually had a hiring manager say those words to me. Your warehouse resume must prove you can meet the aims and objectives of warehousing. But what is a warehouse job? And what are warehouse duties for a resume? It depends. Warehouse supervisor duties and responsibilities change from company to company. Likewise, looking at forklift driver resume samples won't help you show you fit a specific forklift operator job. A better question is "What are the duties for this warehouse opening?" FXA Distribution Management prides itself in its employees. Brands like Nordstrom, Amazon, and Walmart trust us to stock, pick, pack, and ship. We're looking for pickers for the 9am - 6pm shift. Pay is competitive with Target warehouse worker salary or Amazon fulfillment associate worker salary. Pick products in a fast-paced warehouse. Count product and compare to manifest. Keep accurate records and reports. Comply with OSHA standards. That warehouse job description should help you pick your bullet points. Maybe you have warehouse packer experience. You can list it, but for this job, your resume should focus on picking, speed, accuracy, record keeping, and OSHA compliance. Peek again at the warehouse resume sample at the top of this guide for more ideas. Pro Tip: Be as specific as possible. Maybe you were a warehouse supervisor, but did you manage one employee, or fifteen? Want to aim your stock associate resume or warehouse supervisor resume at the target? See our guide: "6 Tips on How to Tailor Your Resume to a Job Description (Examples)"
Use the job offer as your map. Highlight all the warehouse skills and responsibilities in it. Then use them in your warehouse resume. Prove your warehouse worker skills. Show evidence in your warehouse resume bullet points. Add "other" sections to your warehouse packer resume or stocker resume. They'll pallet-jack you straight into the job. After you submit your application, remember to follow up. Do you have questions on how to write a great warehouse worker resume? Not sure how to describe your skills or achievements? Give us a shout in the comments! We'll answer as soon as possible.